Creating mind maps or webs is one of my favorite ways to organize ideas and information. I've often had my students create mind maps as an exercise in making visual connections between important concepts, events, and people in a unit of study. The following free tools offer good options for creating mind maps online. MindMup is a free mind mapping tool that can be used online, with Google Drive, and on your desktop. MindMup works like most mind mapping tools in that you can create a central idea and add child and sibling nodes all over a blank canvas. MindMup nodes can contain text and links. When you're ready to save your MindMup mind map you can save it to Google Drive, save it to your desktop, or publish it online. If you publish it online, you can grab an embed code for it to post it in a blog post or webpage. Lucidchart offers a simple drag and drop interface for creating flow charts, organizational charts, mind maps, and other types of diagrams. To create with Lucidchart just select elements from the menus and drag them to the canvas. You can re-size any element and type text within elements on your chart. Arrows and connecting lines can be re-sized, repositioned, and labeled to bring clarity to your diagrams. Google Chrome users can use Lucidchart offline through the Lucidchart Chrome app. Lucid Chart offers the option to include interactive tables and notations to your charts. You can right-click on any shape in your mind map to write and add a note about it. Coggle is a collaborative mind-mapping service that is very easy to use. To create a Coggle mind map just sign-in with your Google account and click the "+" icon to start your mind map. After entering the main idea of your mind map you can add branches by clicking the "+" icons that appear next to everything you type. To re-arrange elements just click on them and drag them around your screen. Coggle is a collaborative tool. You can invite others to view and edit your mind maps. You can also just invite others to view by sending them an email through Coggle. All Coggle mind maps can be downloaded as PDFs or PNG image files. Simple Surface is an online whiteboard tool that you can use to collaboratively create outlines and mind maps. To get started with Simple Surface just click on "use for free now," double click on the surface, and then start typing. To create an additional thought box just double click anywhere on your board. To make sibling and child thought boxes use the enter and tab keys. You can edit the color and size of fonts. Your boxes can be linked to URLs too. Right-click on your surface to open the full menu of editing options. Sketchlot is a free collaborative whiteboard service that works on any device that has a web browser. I tested it on my MacBook, my iPad, and my Android tablet. Sketchlot is designed for teacher and student use. Teachers create their own accounts and then inside that account they can create a list of students. Each student is assigned his or her own password to use to join a drawing shared by his or her teacher. Teachers can create as many drawings as they like and share them on an individual basis. Teachers can share their drawings to one or all of their students at a time. Students can create their own sketches to share back to their teachers through Sketchlot. Realtime Board is a nice tool for hosting online, collaborative brainstorming sessions. I've featured the service a couple of times since its launch last fall. The service allows to work with any information and visual content on one board individually or with the team. You can draw, work with images, post videos, post and mark PDFs, write notes, and comment on materials through the use of colorful post-it stickers. Realtime Board supports importing files from your Google Drive account. Realtime Board offers a free education version. The education version provides schools with all of the features of the Pro version for free. That means you can create unlimited private and public boards, have an unlimited number of collaborators, and 3GB of storage space. Text 2 Mind Map offers a great way to turn your typed outlines into mind maps. To create a mind map on Text 2 Mind Map type out an outline in the text box. After typing your outline click "draw mind map" to have your mind map created for you. If after creating your mind map you need to add more elements to just add them into your outline and click "draw mind map" again. Your mind map can be downloaded as a PDF or PNG file. The mind maps that you create on Text 2 Mind Map can also be shared via email, Facebook, or Twitter. Stormboard is a slick new service designed for hosting collaborative online brainstorming activities. Stormboard allows you to create an unlimited amount of "idea boards" or Stormboards with up to five collaborators on each one. Each of your Stormboards can include sticky notes, images, videos, drawings, and word documents. Moving items around on your Stormboard is a simple drag and drop process like the one you may have used on services like Padlet. Each item that you add to your Stormboard includes a commenting option that your collaborators can use to give you feedback on your ideas. Connected Mind is a free mind mapping tool that you can find in the Google Chrome Web Store. Using Connected Mind you can create free-form mind maps or use a template. A lot of mind mapping tools lock you into using straight lines between elements, but Connected Mind is not one of them. Connected Minds allows you to create mind maps in any configuration that you like. As it is a Chrome Web Store app, Connected Mind allows you to save your work online using your Google Account credentials. Spider Scribe is an online mind map creation service. Spider Scribe can be used individually or be used collaboratively. What jumps out about Spider Scribe is that users can add images, maps, calendars, text notes, and uploaded text files to their mind maps. Users can connect the elements on their mind maps or let them each stand on their own. You can embed your interactive SpiderScribe mind map into your blog or website. If you would like to see how SpiderScribe works, check out Russell Stannard's series of how-to videos or watch this two minute demo. The next time you're searching for a cartier replica watches movie or television show that you want to show in school or watch at home, try Watchily to search multiple video providers in one place. Watchily is a search engine that pulls results from popular movie and television show providers. Enter your search in Watchily and get results from Hulu, Netflix, Vudu, HBOGo, iTunes, Amazon, MaxGo, Comcast XFINITY, Redbox, and Showtime Anytime. Watchily results can be refined according to movie/ television content rating, price, duration of cheap omega replica watches video, genre, and hosting service. Watchily is not going to change the way we teach or the way that students learn, but it could save you time the rolex replica watches next time you're looking for a video that you want to use in your classroom. TagCrowd offers three ways to create word clouds. You can create a word cloud by copying and pasting text into TagCrowd, you can upload a plain text file, or you can copy and breitling replica watches paste a web address into TagCrowd. After using one of those three methods you can specify how many words you want to display, you can select to show the word count in your word cloud, and you specify words to exclude common words like "the" are automatically ignored. TagCrowd supports fifteen languages. Tagul is a free word cloud generator that offers the option to link every word in your word cloud to a Google search. Click on any word in your word cloud to be taken directly to a Google search results page for that word. Tagul creates a word cloud from text you copy into your Tagul account. Tagul will also generate a replica breitling Navitimer word cloud from any url you specify. Just as you can with other word cloud generators, Tagul allows you to specify words to ignore in creating your word clouds. Once your word cloud is created Tagul provides you with an embed code to put your cloud on your blog or website. Tagxedo makes it very easy to customize the design of your word clouds. You can select from a variety of shapes in which to display words or you can design your shape for your word cloud. You can enter text into the word cloud generator manually or simply enter a url from which Tagxedo will generate a word cloud. As with cartier replica watcehs other word cloud generators you also have options for excluding words from your word clouds. The Online Labs is based on the idea that lab experiments can be taught using the Internet, more efficiently and less expensively. The labs can also be made available to Breitling Replica bently watches students with no access to physical labs or where equipment is not available owing to being scarce or costly. This helps them compete with students in better equipped schools and bridges the digital divide and geographical distances. The experiments can be accessed anytime and anywhere, overcoming the constraints on time felt when having access to the physical lab for only a short period of time. The concepts and rolex replica watches for men understanding of the experiment. The development of online labs includes the study and use of mathematical techniques to demonstrate the various complex functions in diverse areas of science. The labs make use of cutting edge simulation technology to create real world lab environments. Thorough study and research is done by research personnel for better understanding of the experimental procedures. Real lab scenarios are captured through live demonstration of the experiment so as to assimilate information on the procedures and lab equipment. Visualisation and fake breitling watches for sale development of the graphical symbols are done based on realistic situations and compared with the respective real equipment. Simulations are made interactive using various authoring tools, thus recreating and simulating a real lab environment. The Interactive Ear is a neat website through which students can breitling replica watches for sale learn about how the human ear works. The site has three sections; the outer ear, middle ear, and inner ear. 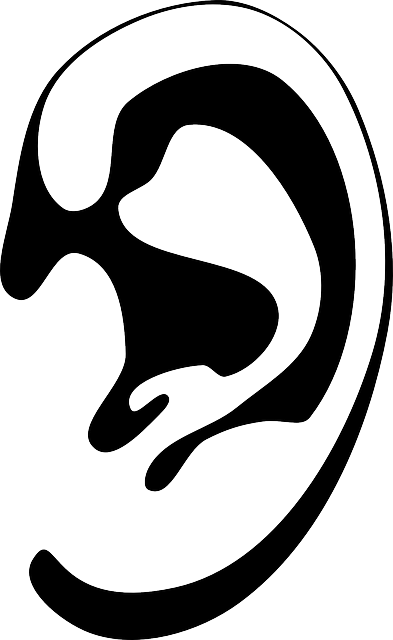 In each section students can click on little pinmarks on the drawings to learn about the parts of the ear and their functions. 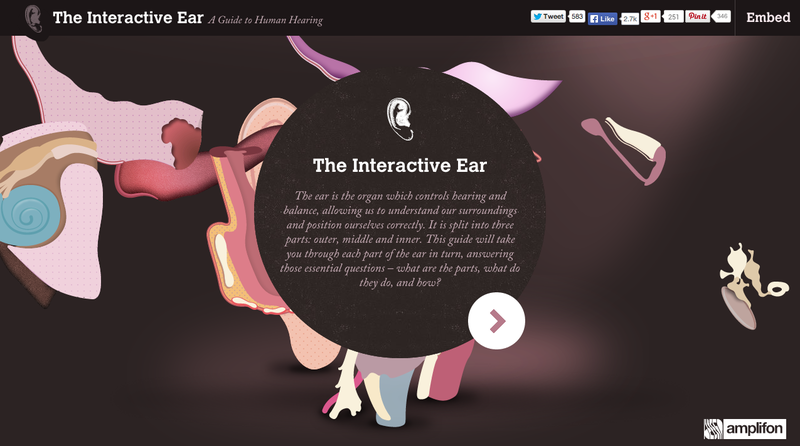 Students can also click the "journey" button to see how sound travels through the ear. On its own The Interactive Ear is a good resource for students of omega replica Speedmaster anatomy and physiology. Combine use of the site with the free iPad app Sound Uncovered to help students understand how sound travels and how we hear it. This afternoon I stumbled upon a neat NASA resource that elementary school and middle school students might like. This interactive display gives students the opportunity to learn about six generations of the NASA space suits. Clicking on one of the space suits gives students a short history of why that suit was developed, its unique parts, and how it functions. The cheap omega replica watches introductory animation to the display explains to students why astronauts need to wear space suits and what would happen if they didn't wear a space suit. In exploring the history of the space suits students can learn TAG Heuers replica watches a bit about atmospheric pressure, friction, and this history of the U.S. space program. 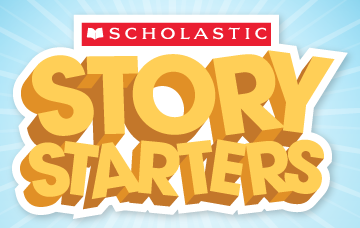 Scholastic Story Starters is a great tool that students will enjoy using to create short, creative fiction stories. 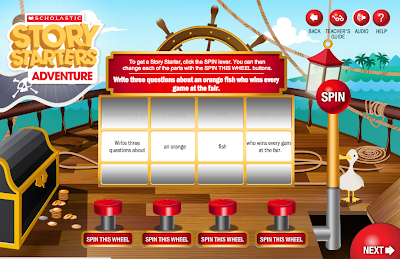 Scholastic Story Starters offers four story themes; fantasy, adventure, sci-fi, and scrambler. To create a story on Story Starters a rolex replica watches students picks a theme, enter his or her name, chooses his or her grade, and spins the big wheels of prompts. 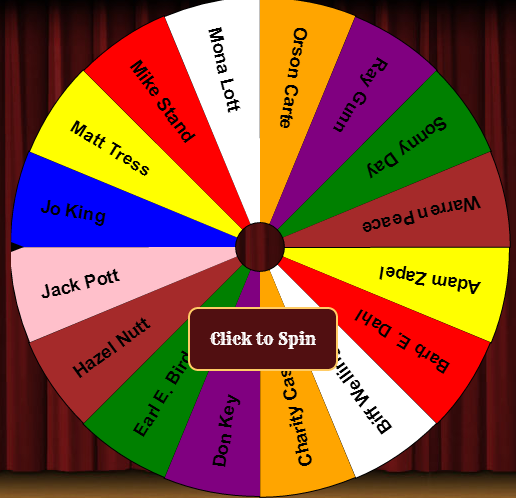 The student can spin the wheels until he or she finds a prompt he or she likes. After the prompt is selected the student can write his or her story using the letter, postcard, notebook, or newspaper format provided by Scholastic Story Starters. When the story is finished it can be printed. Story Starters will work on your students' iPads. Scholastic offers an extensive teacher's guide to Story Starters. Scholastic suggests addressing some of the following story elements through the use of Story Starters. What happens in the beginning, middle, and end of this story? What words or phrases describe where the story takes place? This month's issue of National Geographic includes a feature on glacial meltdown. Part of the online complement to that article is the interactive map of estimates of coastline changes based on glacial meltdown that I posted last week. That map is fairly basic and I had received a few requests for more resources for teaching about climate change. Here are six other resources through which students can see the effects of climate change. Google, NASA, USGS, and TIME host timelapse imagery that depicts how the Earth's surface has changed over the last 25 to 30 years. Using the TIME Timelapse powered by Google you can see how shorelines have changed, cities have grown, and glaciers have shrunk. Start out with some the featured imagery on the homepage then search for other places around the world. The first place I searched for was Cape Cod. Climate Commons is an interactive map developed by the Earth Journalism Network. The map features weather data and emissions data related to climate. The map allows you to compare baseline weather data with anomalies and extreme weather events. The map also features articles about climate change. The articles are displayed on the map according to location. NASA's State of Flux image collection features before and after pictures of more than 200 locations worldwide. The satellite images show the effects of climate change, natural disasters, and land use on places all over the globe. For some examples from the breitling replica watches for sale State of Flux collection take a look at the impacts of dam building in Brazil, drought along the Mississippi River, or volcanic activity in Iceland. You can browse for images by clicking placemarks on the State of Flux Google Map or by scrolling through the image gallery. Surging Seas, produced by ClimateCentral.org, is an interactive map of the potential impact on the United States of rising sea levels. The map allows you to click along coastal areas on the east coast and west coast to see how high the sea level could rise. The Surging Seas maps also project the number of people, homes, and land area that could be affected if the projections are correct. Glacier Works is a non-profit organization studying the breitling replica watches shrinking glaciers of the Himalaya and the impact of glacier melt on the people of the region. One of the neat features of the Glacier Works website is the panoramic before and after images. The panoramas show images of the glaciers from the 1920's side-by-side with recent images. You can quickly compare the two views by sliding your cursor across the panoramas. The Bill Nye The Science Guy iPad app is a free iPad app on which students can watch Bill Nye videos, play games, and discover kitchen table science experiments to do at home with their parents. The app is beautifully designed. Students enter the app by “scanning” their thumbprints. After entering the app students select an object on Bill Nye’s desk. Each object launches a new cheap breitling replica watches element of the app. My only complaint about the app is that in the video section it looks like you have to buy the videos (it’s an option) even though you can watch them for free. Virtual Heart is a free iPad app that allows users to take a closer look at how the human heart functions. The free app lets users speed up and slow down the virtual heart rate. Users have four views of the rolex replica masterpiece heart in the app. The views are of the electrical system, the valves, blood flow, and the interior of the heart. Each view can be experienced with or without labels. The first time each view is tapped, a short introduction to that view is displayed. Solve the Outbreak is a free iPad app produced by the Centers for Disease Control and Prevention. The app is a game that contains three epidemics for students to research. In each investigation students have to read the background, read clues, analyze data, and answer questions. The questions put students in the role of a medical professional tasked with cheap breitling replica helping to curtail the spread of the epidemic. Points are awarded to students for correct answers. Simple Surface is an online whiteboard tool that I initially reviewed a couple of Replica Breitling Chronomat Evolution years ago when it was known as My Simple Surface. The "my" was dropped from the name because the tool is now a collaborative tool. With Simple Surface you can collaboratively create outlines and mind maps. To get started with Simple Surface just click on "use for free now," double click on the surface, and then start typing. To create an additional thought box just double click anywhere on your board. To make sibling and child thought boxes use the rolex replica Datejust enter and tab keys. You can edit the color and size of fonts. Your boxes can be linked to URLs too. Right-click on your surface to open the full menu of editing options. Simple Surface could be a great tool for students to use to Rolex replica for sale create webs and mind maps to plan creative stories, draft outlines for research reports, or diagram a set of concepts they're trying to connect. You could also have students use Simple Surface as a storyboard tool to plan video projects. Read Write Think offers a bunch of great web, iOS, and Android applications for students. One of those that I recently learned about from David Kapuler is Read Write Think's Timeline creator. RWT Timline is available as a omega replica watches store web app (Flash required), as an Android app, and as aniPad app. 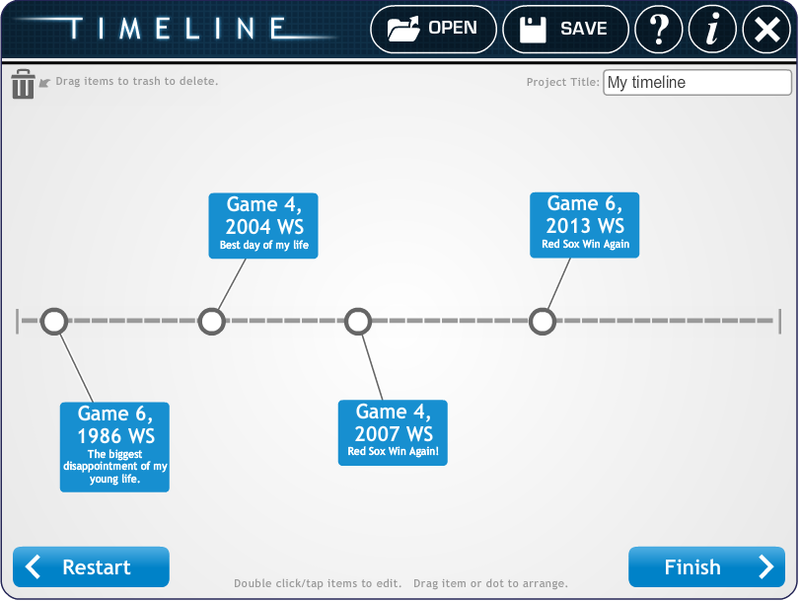 All three versions make it easy for students to create timelines for any series of events. To create a timeline with RWT Timeline students first tap or click along a blank line to add an event. Events can include dates in any format. Each event has room for a brief description and an image. Longer descriptions can be written but they won't appear on the timeline, they'll only appear in the fake rolex for sale printed notes about the timeline. Students can drag and drop events on their timelines to create appropriate spacing between each event. The Android and iPad versions of RWT Timeline support multiple user profiles making it a great choice for classrooms that have more students than tablets. The web version of RWT Timeline also supports multiple users. The aspect of RWT Timeline that I appreciate the most is the flexibility of date formats. In fact, if you look at the following screenshot of my sample timeline you'll see that I didn't use specific dates at all. The use of RWT Timeline doesn't have to be limited to history courses. Students could use RWT Timeline to breitling replica watches create timelines of the plot of a story they've read. Or they could use it to plan the plot line of a story they're planning to write. A couple of months ago Curriki released a series of six PBL geometry projects that could make geometry interesting and fun for high school students.Curriki's new geometry course features six PBL projects. Each of the projects is aligned to Common Core Standards. The course is not a self-directed course for students. The course is designed to be taught by mathematics teachers who want to incorporate PBL. The projects in the course can be used in sequence or used as stand-alone units. All materials needed for leading the projects are included available on the Curriki site. You will have to create an account and sign-in in order to access the materials. Curriki accounts are free. Opus is a service that aims to help middle school mathematics teachers discover sample math problems aligned to Common Core standards. To find problems on Opus search by entering a topic and selecting a grade. You can also find problems by clicking the "browse the Core directly" link on the Opus homepage. Either way when you find a problem you can save it to your free Opus account where you can then generate a Word doc or Google Document of all of your saved problems. You can also create an answer sheet in your Opus account. MathDisk is a service that teachers can use to develop interactive mathematics worksheets. Through MathDisk's "Math Builder" tool you can design mathematics models that your students can use online. The models and worksheets you develop online can also be downloaded to use offline if you also install the MiBook software on your desktop or on your Android device. If you don't have time to create new materials, the MathDisk gallery has pages of models and worksheets that you can choose from. Everything in the gallery, like everything you create through MathDisk, can be downloaded and or embedded into your own website or blog. TenMarks is a service that offers an online mathematics program designed to supplement your in-classroom mathematics instruction. All of the problems in TenMarks' bank of more than 20,000 are aligned to Common Core standards. Within TenMarks teachers create class rosters and accounts for their students. After creating rosters teachers can assign practice problems to students. Teachers can assign problems based on the Common Core Standards that their students are trying to reach. If you use GeoGebra in your classroom, you should bookmark GeoGebraTube. GeoGebraTube is a community site for teachers who teach with GeoGebra to share and find a wide range free resources. On GeoGebraTube visitors will find user-created tutorials, lessons, and worksheets. Visitors can search for fake rolex replica watches resources by age group, language, and material type. All materials are freely available for noncommercial re-use. Math Open Reference is a free online reference for geometry teachers and students. Math Open Reference features animated and interactive drawings to demonstrate geometry terms and concepts. The table of contents on Math Open Reference is divided into four basic categories; plane geometry, coordinate geometry, solid geometry, and function explorer tools. Click on any subject in the first three categories to find definitions, examples, and interactive drawings. In the function explorer category users can select linear functions, quadratic functions, or cubic functions to explore how changes in variables affect the graphed output. Dan Meyer has a site called 101 Questions on which he is sharing images and videos as prompts for developing math questions. Each image and video has a 140 character field in which patek philippe replica watches sale you can enter your question. Questions are compiled and can be Tweeted. Take a look at the top 10 to get a feel for what you will find on 101 Questions. I've embedded one of the videos from 101 Questions below. I won't pretend to be able to explain the larger purpose of the site as well as Dan does, so I'll just encourage you to go read his blog post about it. And if you need more background on who Dan Meyer is, watch his TED Talk Math Class Needs a Makeover. ULearniversity is a free site featuring arithmetic and algebra lessons. On ULearniversity you can watch tutorial videos and practice the concepts taught in the videos. ULearniversity provides instant feedback on your practice problems. As a registered ULearniversity user you can track your progress. Math Shorts is the latest addition to Planet Nutshell's line-up of Replica Breitling Navitimer watches uk animated educational videos. Math Shorts will eventually have twenty videos in the series. Right now the series contains eight animated videos for elementary school and middle school students. Each of the videos has a Common Core standard aligned to it. All of the videos have supporting materials from PBS Learning Media attached to them. The first video in the series is embedded below. Aww App is a simple browser-based application for creating drawings. To get started just go to AwwApp.com and click on "start drawing." To invite people to collaborate on your drawing just send them the link assigned to your drawing board and they can join in the drawing fun. 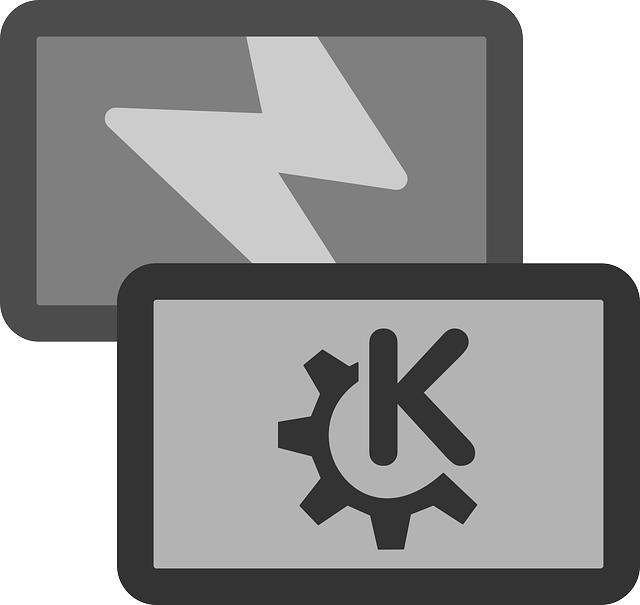 Aww App will work in the browser on your laptop, Chromebook, Android tablet, and iPad. If you would like to use Aww App on your classroom or school website and you have familiarity with editing the code of your site, you can install Aww App for free. PixiClip is a great new tool tool for creating, narrating, and sharing drawings. PixiClip provides a whiteboard space on which you can draw, upload images to mark-up, and type. While adding elements to your PixiClip whiteboard you can talk and or record a video of yourself talking. In fact, you can't use the whiteboard without at least recording your voice at the same time. Recordings can be shared via social media and or embedded into your blog posts. PixiClip does not require you to create an account in order to use the service. However, if you want to save your recording to re-visit and edit you will need to create an account. Accounts are free and take less than thirty seconds to create. Stoodle is an online whiteboard service supported in part by the CK-12 Foundation. Through Stoodle you can quickly create a collaborative whiteboa rd space. On your whiteboard you can type, draw, and upload images. You can connect Stoodle to your computer's microphone and talk your breitling replica watches collaborators while drawing, typing, or sharing images. Stoodle does not require you to create an account. To create a Stoodle whiteboard space just click "launch a classroom," name your room, and share the URL assigned to your room. Draw It Live is a nice little website that offers a free space for you to instantly create a collaborative whiteboard to use with anyone you like. To use Draw It Live just go to the site, click the "collaborative whiteboard" link, enter any nickname you want, then start drawing. You can invite people to draw with you by sending them the url assigned to your whiteboard. Draw It Live provides a chat box that you can use to talk to your collaborators about what each of you is doing on the screen. FlockDraw is a simple service that allows people to quickly and easily collaborate on the creation of a drawing. To use FlockDraw simply visit the site, click the "start drawing" button, and rolex replica watches uk start drawing. To invite other people to draw with you, just send them the url assigned to your drawing board. What's really neat is that anyone who visits the url after the drawing has started will see all of the drawing motions they missed unfold in front of them. You can embed your FlockDraw drawings into a website. Realtime Board is a nice tool for hosting online, collaborative brainstorming sessions. I've featured the service a couple of times since its launch last fall. The service allows to work with any information and visual content on one board individually or with the team. You can draw, work with images, post videos, post and mark PDFs, write notes, and comment on materials through the use of colorful post-it stickers. Realtime Board supports importing files from your Google Drive account. Realtime Board offers a free education version. The education version provides schools with all of the features of the Pro version for free. That means you can create unlimited private and public boards, have an unlimited number of omega replica Seamaster collaborators, and 3GB of storage space. Quizlet is a popular flashcard service that students can use in their web browsers or install as apps on their iOS and Android devices. Quizlet offers some helpful features in addition to the standard options of creating and sharing sets of flashcards. Quizlet offers a text-to-speech mode in eighteen languages. Second, they launched a new study mode that they've name "speller." Speller mode plays words for you that you then have to type correctly into the space provided. If you misspell the word that is read to you, Quizlet will show you your errors. Quizlet flashcards can be used without an internet connection if you have the Android or iOS app installed on your mobile device. Cobocards is an online and mobile flashcard system that I first reviewed about fifteen months ago. Cobocards is available to use in a Replica Breitling Chronospace web browser as well as an iPhone and an Android app. Cobocards has a gallery of public flashcard collections that students can sort through to find flashcards for the topic(s) they're studying. If students create their own flashcards on Cobocards, they will be provided with PDF copies of their flashcards that they can print to study offline. Of course, they can also study flashcards online. When students study their flashcards online or through the mobile apps, Cobocards will keep track of their results for them. Finally, Cobocards allows students to share flashcards publicly or privately. Easy Notecards is an online flashcard service that allows you to create flashcards that are text-based and create flashcards that utilize images. Like many other online flashcard services, Easy Notecards provides a gallery of public sets of flashcards. Some of the flashcard sets in the public gallery are connected to textbooks. This is accomplished when users creating flashcards opt to enter information about the textbook from which they are working to create flashcards. For example, if I was creating a set of flashcards about the American Civil War and using the textbook The Americans, I could enter the book title and chapter that matches the flashcards I am creating. Then when others search the gallery of flashcards they could search by topic or search by textbook title. Faux Flash is an easy-to-use flashcard service. On Faux Flash you can create your own flashcard sets or browse for sets created and shared by other users. All flashcards that you create with Faux Flash can include images in the questions and answers. You can register for Faux Flash using your email address, Twitter account, or Facebook account. ExamTime is a free service that middle school, high school, and omega replica watches college students can use to prepare for tests. I tend to like any service that offers a mind map option for students and ExamTime does so I had to try it out. When students signs into their ExamTime accounts they can create flashcards, mind maps, and practice quizzes to help them study. Students can arrange their materials into topics. All materials can be shared with other Examtime users. Cram is a free online flashcard service that used to be known as Flashcard DB and Flashcard Exchange. The latest version of the service keeps the same concept as earlier versions, just with a different name. On Cram you can search through a database of more than 50 million online flashcards. As you browse through the flashcards you can add them to sets that you create and store in your account. If you cannot find the flashcards for you in the Cram database, Cram gives you tools to create your own flashcards. You can create flashcards on an individual basis or in a group by importing a CSV file. Flashcard Stash is a free vocabulary flashcard service for teachers and students. The service makes it easy to quickly create flashcards and sets of flashcards. As a registered user of Flashcard Stash when you type a word into a blank flashcard suggested definitions and sample context sentences are provided to you. You can then choose to add one or all of those definitions and sentences to your flashcard or you can write your own definitions and sentences. When making your own flashcards you can include images. If you don't have time to create your own flashcards you can choose to work with some of the pre-made lists of flashcards. Teachers registered on Flashcard Stash can create flashcard sets to share with their students. Teachers can create and manage multiple class lists within their accounts. Sharing class lists can be done by inviting students to view the flashcards via email or by posting a password-protected link to the lists on a class replica breitling emergency blog. The second method requires students to remember the password that you have created to access the list. Word lists can also be embedded into blogs or websites. Flippity is a free tool for creating flashcards from data in a Google Spreadsheet. Flippity provides clear directions for the simple steps to take to create your flashcards. To create your flashcards use the Flippity template, enter your data, publish the spreadsheet to the web, then grab your Flippity link. Your Flippity link will take you to a Flippity page on which you and your students can flip through your flashcards. Flippity includes a shuffle function and an option to remove cards from your deck of flashcards as you flip through them. Classmint is a free online flashcard service. Like other services similar to it, Classmint can be used to create and share sets of flashcards. A couple of aspects of Classmint make it different from some other flashcard services. First, Classmint will read your flashcards to you. Second, in addition to supporting the use of images in your flashcard, Classmint allows you to annotate those images on your flashcards. Card Kiwi is a flashcard service whose appeal is its simplicity. Flashcards on Card Kiwi are text only. As you flip through your flashcards you rate your understanding by simply clicking thumbs up, thumbs down, or thumbs sideways. Card Kiwi will show you the cards that you rate with a thumbs down or thumbs sideways more often than the others until you're using the replica breitling uk thumbs up on every card in your set. VideoNotes is a neat new tool for taking notes while watching videos. VideoNotes allows you to load any YouTube video on the left side of your screen and on the right side of the screen VideoNotes gives you a notepad to type on. VideoNotes integrates with your Google Drive account. By integrating with Google Drive VideoNotes allows you to share your notes and collaborate on your notes just as you can do with a Google Document. My first thought when I saw VideoNotes was that it would be a great tool for students to use to take notes, ask questions, and answer questions while watching "flipped" instruction videos. You could assign a video for homework and have your students ask and or answer questions using VideoNotes. Have students share their notes with you so that you can see their questions which in turn can influence how you structure your next lesson plan. 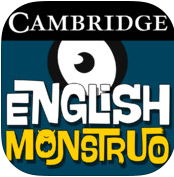 English Monstruo is a free app (iPad and Android versions available) containing eight games designed to help students learn verb conjugation. English Monstruo was developed by researchers at Cambridge University who examined the results of 200,000 exams to determine the words that give Spanish speakers the most difficulty when taking an English exam. 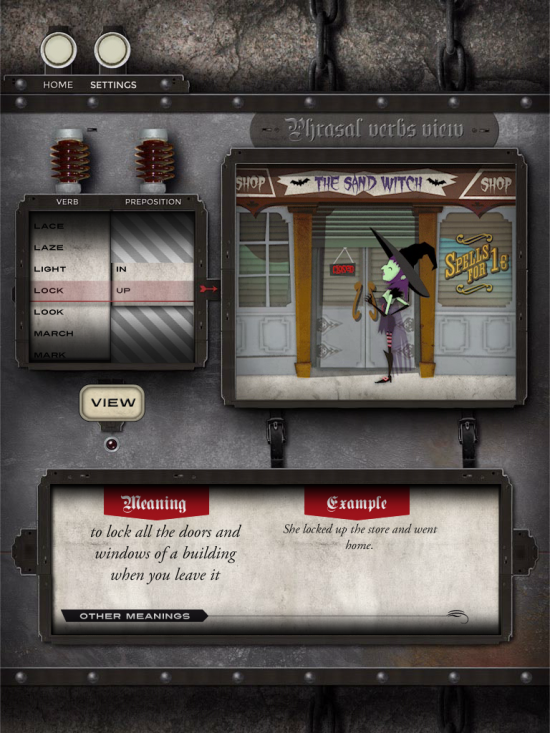 The games in the English Monstruo app contain activities ranging from fill-in-the-blank to sorting words to replacing incorrect words with correct words. Each game has a series of levels to work through to earn points and unlock increasingly more difficult levels. To access all eight games a player needs to first earn the maximum points in the first six games in the app. I found myself sucked into a couple of the games in English Monstruo and I think that students will get sucked into them too. The games provide a fun way to practice recognizing correct spellings and verb conjugations. The games are designed for intermediate level ELL students. In the right setting the flipped classroom model can work well for some teachers and students. I recently received an email from a reader who was looking for a recommendation for a tool would enable her to add an assessment aspect to her flipped lesson. Here are some tools that can accomplish that goal. eduCanon is a free service for creating, assigning, and tracking your students' progress on flipped lessons. eduCanon allows teachers to build flipped lessons using YouTube and Vimeo videos, create questions about the videos, then assign lessons to their students. Teachers can track the progress of their students within eduCanon. To create lessons start by identifying a topic and objective then searching YouTube and Vimeo from within the eduCanon site. Once you've found a suitable video you can build multiple choice questions throughout the timeline of your chosen video. You can create as many lessons as you like and assign them to your students at any time. The video below provides a short overview of eduCanon. Knowmia is a website and a free iPad app for creating, sharing, and viewing video lessons. One of the best features of Knowia is a tool that they call the Assignment Wizard. The Knowmia Assignment Wizard allows teachers to design assignments that their students have to complete after watching a video. Students can check their own Knowmia accounts to see the assignments that their teachers have distributed. To aid teachers in assessing their students, Knowmia offers an automatic scoring option. 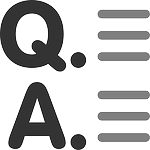 Knowmia's automatic scoring function works for multiple choice questions and numeric questions. The automatic scoring is based on your answer key. Assignments are scored when students make a submission. Along with automatic scoring teachers have the option to see when a student initially opened an assignment and how many questions they've tried before submitting the assignment. Visit the Knowmia support blog for a complete run-down of the all of the assignment scoring options. 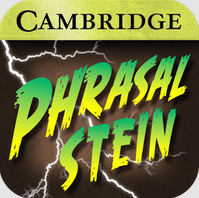 Phrasalstein, developed at Cambridge University, is a great iPad app and Android app designed to help students learn the meanings of phrasal verbs. The app has a practice mode and a quiz mode. In the practice mode students select a verb and a preposition combination then see a short animation demonstration of the meaning of the chosen phrase. 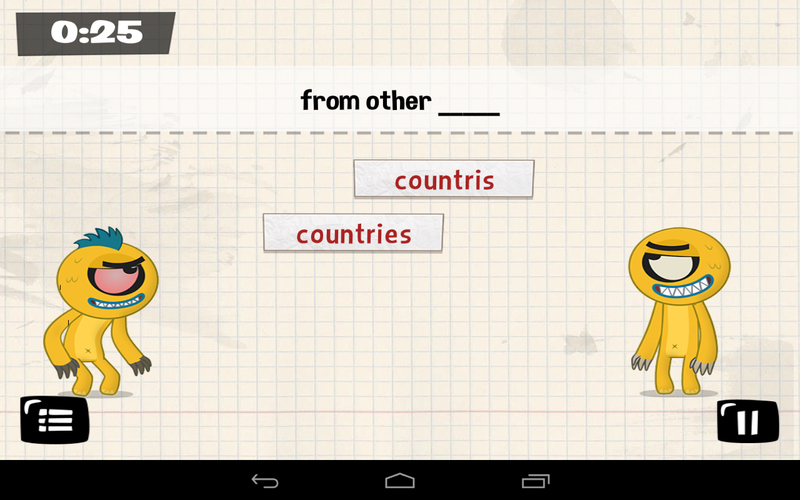 In the quiz mode students see an animation then have to select the matching phrase. Translations of the meanings are available in Spanish, German, Italian, Russian and French. second language. Phrasalstein provides a fun and engaging experience to help students the meanings of common phrasal verbs. Glean is a new service designed to help teachers and students locate educational videos. The site is currently focused on topics in math and science. When you search on Glean you will find video lessons arranged according to topics and Common Core standards. As registered Glean users students can ask questions of other users while they are watching video lessons. After watching a video students have the option to watch it again or click through to a related video lesson. Glean has the potential to be a good place for students to find help with math and science homework. As a teacher you could have all of your students watch a video and enter their their questions in the margin next to the video. Having those questions available to you could be helpful in formulating the next part of a math or science lesson. Random Name Picker is new free tool from Russel Tarr at Classtools.net. The Random Name Picker lets you input names and spin a virtual wheel to have a name randomly selected from the list. After a name is selected you can remove it from the wheel so that it is not selected again. Random Name Picker is free to use and does not require a registration on Classtools.net. You can save your lists by assigning passwords to them. You can re-use your saved lists. The Random Name Picker wheel can be embedded into your blog or website. The Random Name Picker was written in HTML5 so that it will run in the browser of your iPad. At one point or another every teacher has asked for volunteers and not had any hands raised. In that situation using the Random Name Picker could be a fun way to select the order in which students will present to classmates.Or for those times when all of your students raise their hands for something fun like being the line leaders, the Random Name Picker is a convenient tool to have at your disposal. Boom Writer is a service designed to encourage kids to do their best writing and share it with each other to create a small book. Boom Writer provides a "starter chapter" for a story and students continue the story by writing additional chapters. Students submit their chapters to the group. After all of the chapters are submitted (anonymously), the class votes anonymously for their favorite entries. The chapters receiving the most votes make it into a book that students, teachers, and parents can choose to have published by Boom Writer. Here's how Boom Writer works in schools, teachers register their classes and then their students can contribute to one project. Teachers can oversee each student's writing, comment, and edit each student's work. When all of the students have written their contributions the class reads the submissions and votes. The names of the writers aren't revealed until after the voting, thereby eliminating any "classroom politics" that could happen in the voting stage. Read a case study about using Boom Writer in schools here. Read a sample Boom Writer book here. 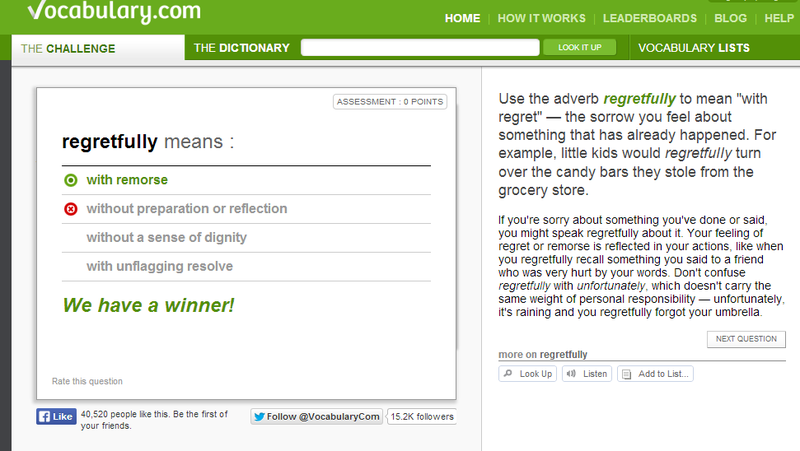 Vocabulary.com has an optional competition aspect to it. Students can play for their schools and climb the Vocabulary.com leaderboard. Of course I had to play with it right away, so I installed it on a few sites (including right here at VA Helper)… You’ve probably noticed the big purple tab on the right hand side of your screen. That’s Speak Pipe. Go ahead, click on it. You know you want to.